Many people think that designing a billboard is all about creativity. Okay, maybe that was a bit full on! Creativity is one of, if not the most important features of designing a great out of home advertising campaign. A study by the Harvard Business Review attempted to quantify the value of creativity. They found that more creative campaigns performed better on average than less creative ads. Yet, you can only do this in retrospect. Quantifying creativity is hard... Who’d have thought? Let’s put our best foot forward to get it right the first time. This post will walk through what a great billboard needs to do and a few ways that you can do it. The best out of home campaigns take a person on a journey. Starting at zero, catching their eye, often through an emotional response, persuading them to engage with your brand. 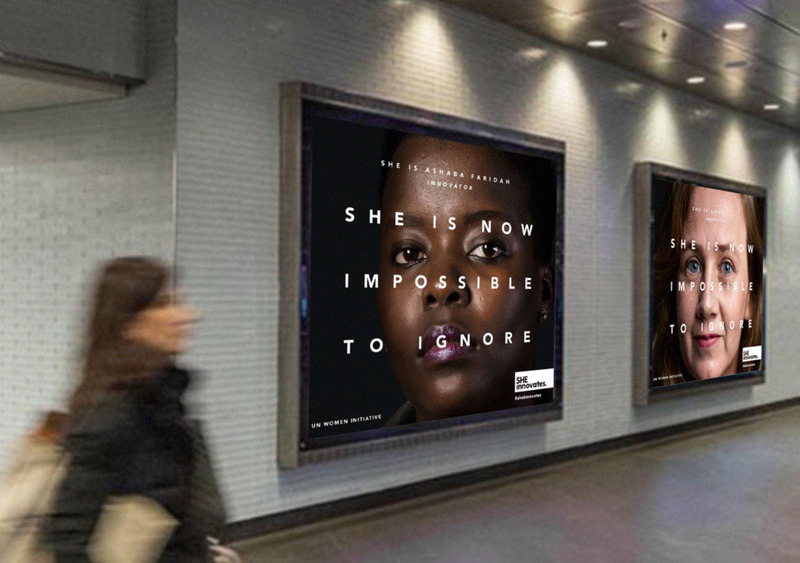 If a campaign only has impact, great it’s caught their attention. But what then? Impact alone doesn’t get you anywhere. An explosion has impact, but it doesn’t lead to a business outcome. Now let’s say the advert has caught their intention and explains what the product is. You’ve made an impact and communicated what it is. This isn’t strong enough alone to make a difference. There needs to be a reason why this person should care. If I asked 10 people if they remember the ad. I bet at least 6 would remember it. Even after 6 years. How many would remember it was made by the telecommunications company Three though? This is why the third element of persuasion is vital. Persuasion ties a great creative with your brand. The result is an emotional response from the customer and commercial gain for the brand. Impact, communication, and persuasion - you have the what, the how and most important the why. This approach will enable you to create a memorable ad that builds awareness and keeps your product top of consumers mind. The average person who sees your ad needs a reason to take action. You can weave a story into all your messaging which adds continuity between channels. This breeds familiarity and breaks down the barriers between prospect and customer. Out of home is a halo media channel that's designed to uplift brand awareness against other channels. From a creative perspective, it has to land the brand story on the head. Brands that get this right are instantly recognizable across media channels. 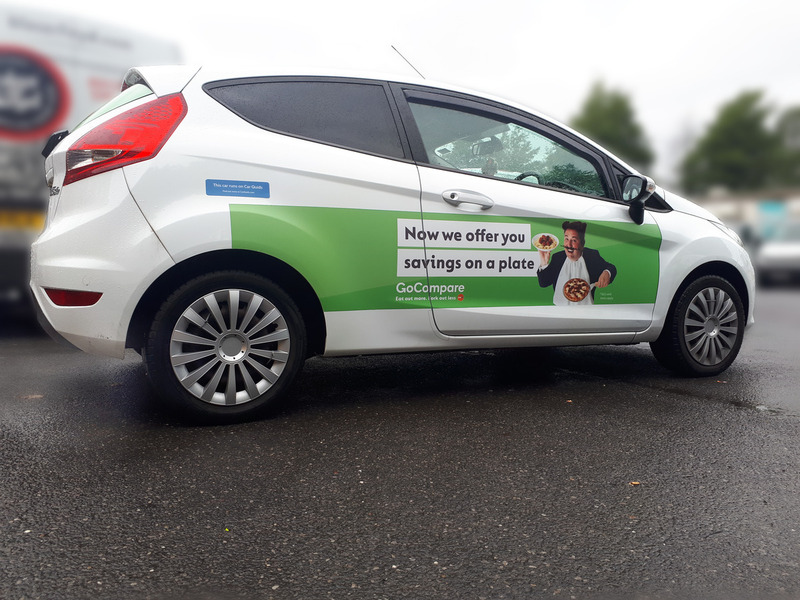 Go Compare used this to great effect when running campaigns across South Wales. The brand resonated with the local population due to the omni-channel messaging as part of countrywide campaign. This resulted in hundreds of thousands of impressions, hundreds of interactions and handfuls of people singing the infamous television jingle in the streets. 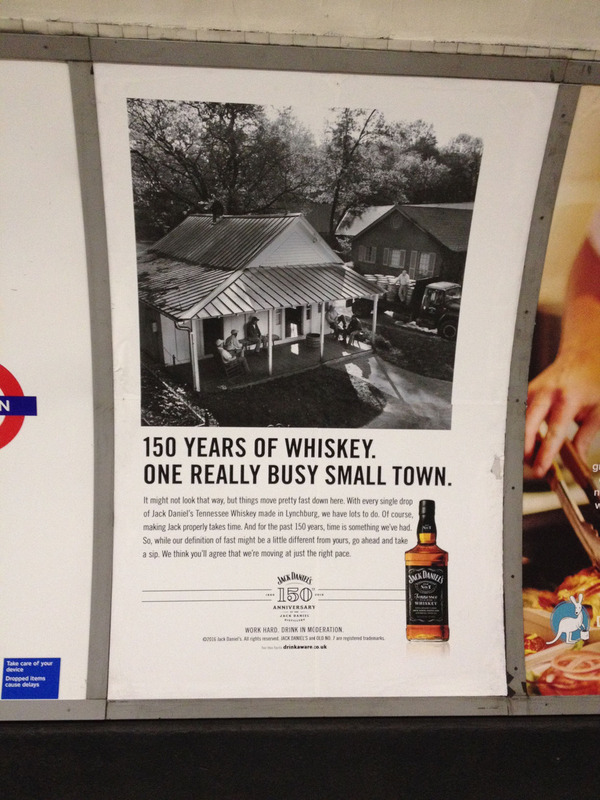 Imagery does the heavy lifting when it comes to creating a memorable advert. The right imagery stirs emotions, inspires memories and can create an immediate response. Create strong imagery to convey your message, favour simplicity and avoid anything too subtle. By the time someone works out your meaning, the moment is gone. Use large and legible fonts. Your text should be short and sweet and convey one core message. As simple and focussed as you can get. Avoid Serif fonts and opt for a bold font. Colours are the heart of a brand’s identity. They are powerful, memorable and using the right colour can stir up an emotional response. Adding contrast and saturation is important to make sure your ad pops. The ad caught their eye, built an emotional response and now they need a reason to take the next step. Help them make that step with a strong call to action. Some ads include a “search for campaign name” call to action. While others like our Makers Academy campaign include an offer such as “Learn to code in 12 weeks”. Offers aren’t essential, but conveying a next step or goal is key. 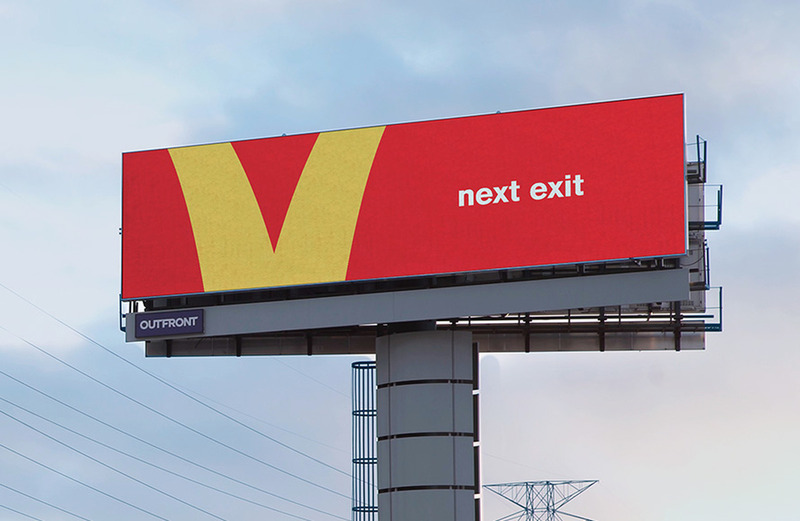 This can be as simple or abstract as Mcdonald’s follow the arch campaign. For online brands, this strategy relies on aligning your digital strategies with the campaign. Whatever call to action you choose, it should result in easy access to your website. Out of home campaigns make it far more likely consumers will search your brand on their mobile. Make sure that you are ranking as close to the top spot for this term as possible so you are found. 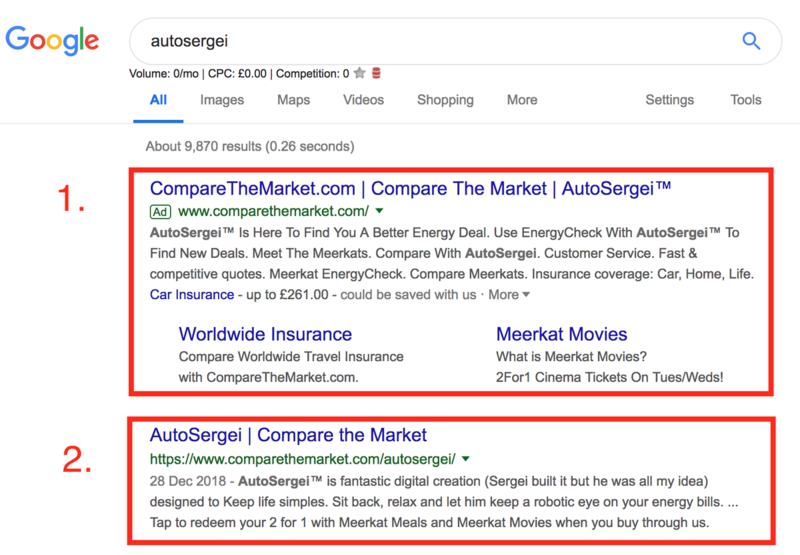 Compare the Market used two techniques to guarantee this as part of their “Search for Sergei” OOH campaign. This is the search result consumers would see when searching for this campaign. 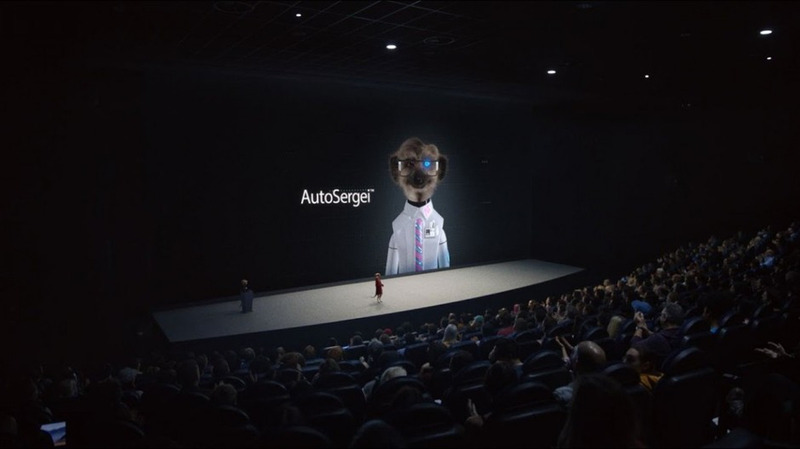 They created a Google Ads campaign which included the keyword “Autosergei”. This ensures that their ad is the first thing anyone searching this term sees. They created a landing page for this campaign. This captured searches with the keywords mentioned on the billboard. Billboard’s aren’t the place to show off how smart you are. Don’t waste those valuable seconds with a clever esoteric quip. By all means, use humour if it fits with the branding. 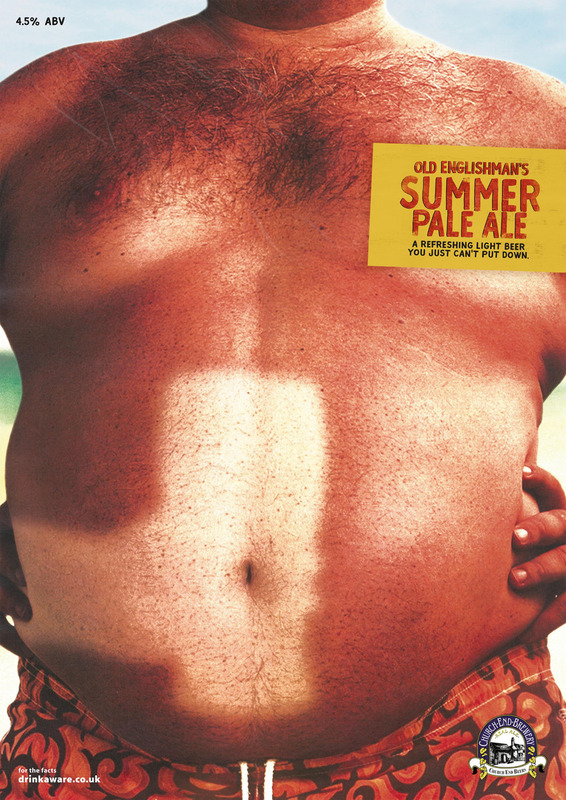 Humour works well for a brand such as Churchill Brewery who poked fun at their customers. But, the majority of brands will do better with a simple, accessible and directive message. Whatever style you opt for, it is important to maintain a consistent brand voice. Consumers spend varying amounts of time with an opportunity to see your ad. Use this to your advantage. 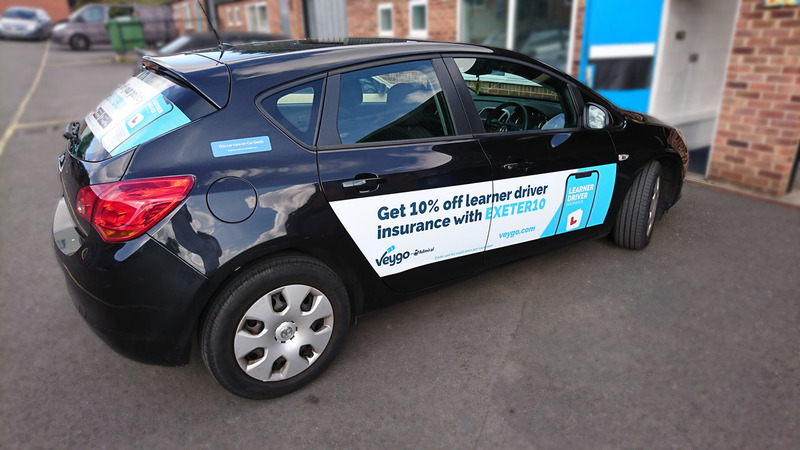 Bright colours and imagery work great for car advertising. 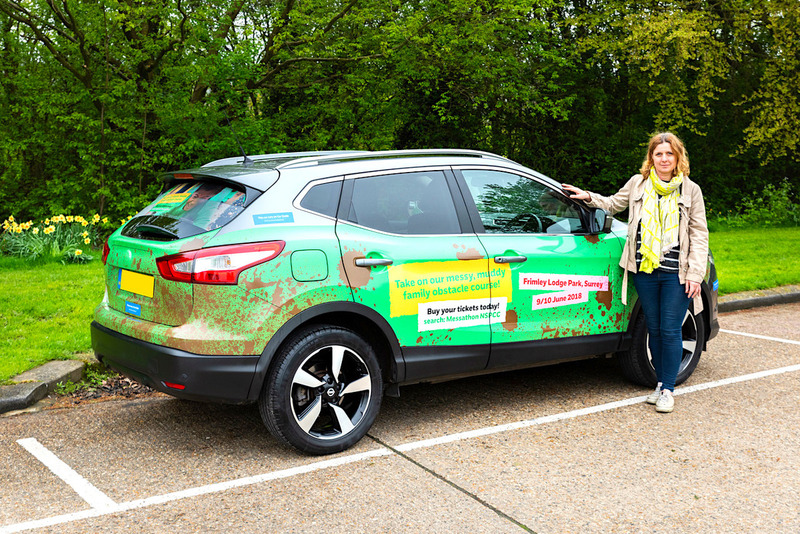 Commuters may only see the car for a few seconds. While the average London commute currently stands at 74 minutes. With commuters often stood on the platform waiting for a tube to shoot towards them. This is an opportunity to take advantage of extended dwell time. In this setting, longer text excerpts can work great. They hold attention while commuters look for something to distract them. I recently spoke with the Dominic Slade and Steve Hanratty of The Builders arms, a Creative Agency in London. They specialise in high-value brand thinking and execution for challenger brands. Here are their suggestions for a startup designing and running their first out of home campaign. "For start-ups contemplating their first out of home campaign; do remember to keep it simple. Be single-minded in what you want to say, keep headlines short and sharp, and don’t be afraid to be visual – because visuals engage. Branding is critical, but that’s not to say you need a logo the size of a house; but the colours you use, the graphic design you employ and the tone of voice you communicate with (humorous/playful/serious) should all be reflective of who you are as a brand."